. . . each lie “steals” a sacred part of you . . .
FORT WORTH, Texas - Jan. 10, 2019 - PRLog -- Lying is saying something with the intent of creating a false belief or impression. It's an attempt to get someone to believe something that is not true. In fact, some people, sad to say, lie almost all the time. Psychologists call these people compulsive or psychopathic liars. They tell lies even when they don't have to. While maybe everybody lies at some point, few understand how destructive it can be, why we do it, and how to stop it. —How many lies do you think you have told this last week? —Who did you tell the lies to? —Why did you tell the lies? —How do you feel about the lies you told now? Unfortunately, lying, it seems, is integral to the human condition. Those laws include never murdering, stealing, or lying. However, what are His other commandments? The world has forgotten them. While it is true that lying causes stress and other awful problems, we often rationalize that it's useful and even necessary at certain times, especially if lying would assure our safety or honesty puts us in danger. 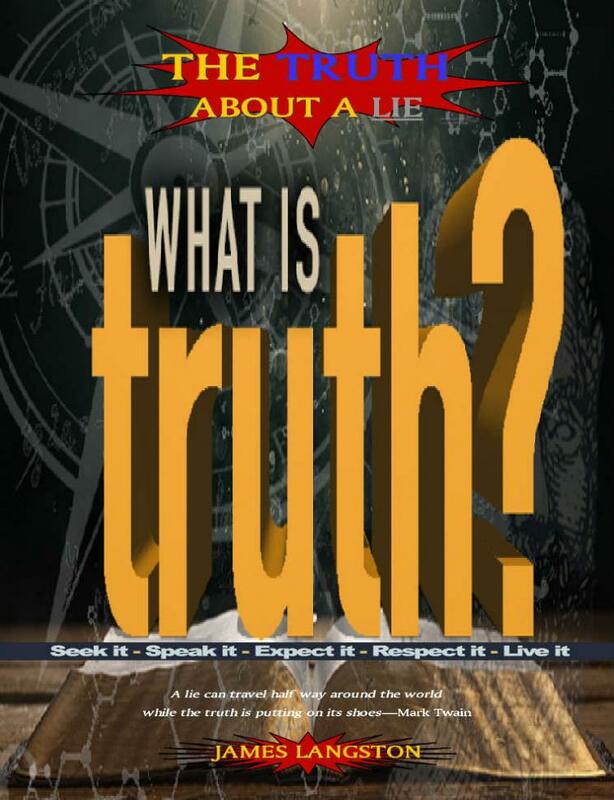 The Truth About A Lie is not a question and answer book; nor is it a systematic guide on how to lie. In it, you will find some simple facts; we are born with a nature that lies, that nature is bent toward the dark and scary, and it only cares about self-preservation. There are no losers in this book. At one time or the other, each of us has stubbed his toe in this minefield called life. However, the sooner we accept that our mistakes and failures do not define who we are; we will be better prepared for the more ominous challenges awaiting us. Not only is everyone capable of lying, everyone has a propensity to lie. Human beings . . . universally possess a talent for deceiving one another. We also have the ability to convince ourselves that we are perfectly honest in most of the circumstances we face. The ability to tell the truth, then, seems to run along the grain of the gospel. We are the ones who deceive, not the ones who speak truth. The weight of sin is found, too, in the places where we can convince ourselves otherwise, not only the faults we already admit. The point of the cross, therefore, and the cleansing renewal of grace, is that it frees us to admit that we are imperfect people, prone to wander, prone to lie. Christ alone is the One in whom no deceit was found. Read this book to be wise, understand it to be healthy, and embrace it for change. You can visit the Pilgrim Outreach Ministries online bookstore at, www.thewilltosucceed.homestead.com. Here you can preview and order James Langston's books at Amazon, Barnes and Noble, Lulu Enterprises and NOOK in paperback or hardcover, or as a Kindle e-Book. For additional information go to pomitaly.homeasted.com (http://www.pomitaly.homestead.com/). Also, follow Langston on Facebook at facebook.com/pastorjameslangston (http://www.facebook.com/pastorjameslangston). Click Here for a short Review of "The Truth About A Lie." James Langston, a retired naval officer, faithfully served his country for 27 years before writing the final chapter of his career in 2003. He is founder and senior pastor of the Pilgrim Outreach Ministries. James is a author, ordained minister, husband, father, grandfather, an Information Technology web developer, a communications officer (public relations specialist), a playwright, and a SyFy writer. James is available for interviews, media appearances, book signings, and speaking engagements. He and his wife Cecilia have been married for almost 40 years. They have six children and fifteen grandchildren.